The White Sands pupfish, a species found only in the Tularosa Basin on White Sands Missile Range , Holloman Air Force Base and White Sands National Monument , will continue to be protected under a recent agreement among state and federal government agencies. The U.S. Army, White Sands Missile Range , Holloman Air Force Base and the New Mexico Department of Game and Fish recently signed an updated version of the Cooperative Agreement for Protection and Maintenance of White Sands Pupfish. 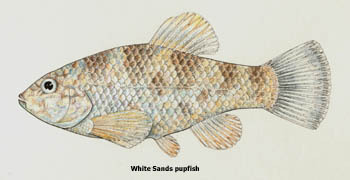 The pupfish, Cyprinodon tularosa, is listed as threatened under the New Mexico Wildlife Conservation Act. The original agreement, signed in 1994, has been instrumental in preserving White Sands pupfish populations and protecting and enhancing habitat on the federally managed lands. The updated agreement will continue that protection and maintenance of the unique species. For more information about the White Sands pupfish or the agreement, please contact Stephanie Carman, Department of Game and Fish, (505) 476-8092 or stephanie.carman@state.nm.us . A carcass tag that didn't match the time of the license-sale led to charges of hunting without a license and illegal possession of a Barbary sheep in an alleged poaching incident near Logan. Travis Oberg, 34, and Brent Daniels, 29, both of Logan, were posing for photographs with the trophy Barbary sheep in Logan on Jan. 2 when Department of Game and Fish Conservation Officer Josh Waldrip spotted them as he was driving through town. Waldrip stopped to check the hunters' licenses and after some investigation, determined Oberg's license likely was purchased after the sheep was killed. Oberg was charged with hunting without a license and illegal possession of a Barbary sheep. Daniels was charged with illegal possession of a Barbary sheep. Court dates are pending for both men. The men face maximum penalties of $100 for hunting without a license, $1,000 for illegal possession of a Barbary sheep, and up to six months in jail. Depending on the outcome of court proceedings, the Department will decide whether to pursue civil penalties to recover the state's loss of a trophy game animal. Civil penalties for poaching a trophy Barbary sheep can be as high as $6,000, according to legislation passed in 2006 and subsequent State Game Commission action. 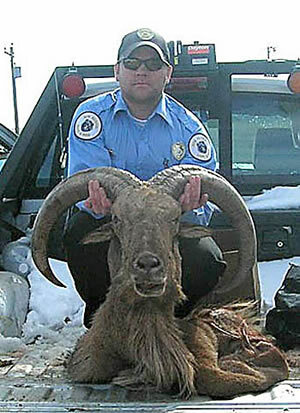 The sheep seized by officer Waldrip had one horn that measured more than 31 inches and another just under 34 inches. Anyone with information about violations of New Mexico 's wildlife laws is encouraged to call Operation Game Thief, (800) 432-4263. Callers can remain anonymous and earn rewards if information leads to charges being filed.